A 1 hr workshop & performance exploring experimental music aimed and kids and their families. Ever since Schoenberg and Kandinsky became pen pals back in 1907, avant-garde art and experimental music has been attempting to find some common ground. But, it’s not been easy. While modern art is a mass phenomenon, experimental music is often derided and ignored by the masses. Here’s our contribution towards a solution: ‘Big Sounds for Little People’. If you couldn’t guess from the snappy title, it’s a gig, for kids and their families, which aims to introduce children to experimental music at an early age. Featuring US based, Dosh, a one-man band, a virtuoso, and West Midlands local circuit-bending fiend Glatze. 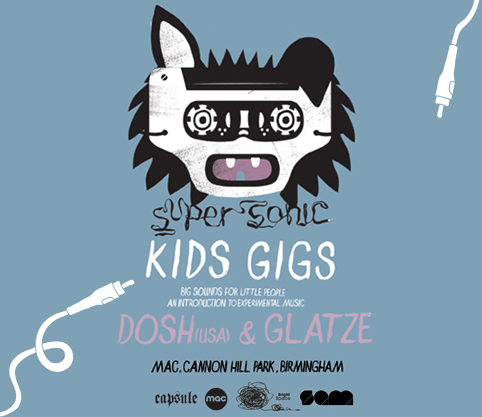 Glatze uses customised instruments (including: circuit-bent Furby dolls and kids’ toys) that have been specially rewired to create all sorts of musical wizardry. Dosh a multi-instrumentalist; combines a host of instruments into an exciting and unique live experience. See firsthand how these unlikely instruments are used to make noise / sound / music, and to have a go yourselves.